A detail from a famous photograph of President Abraham Lincoln. 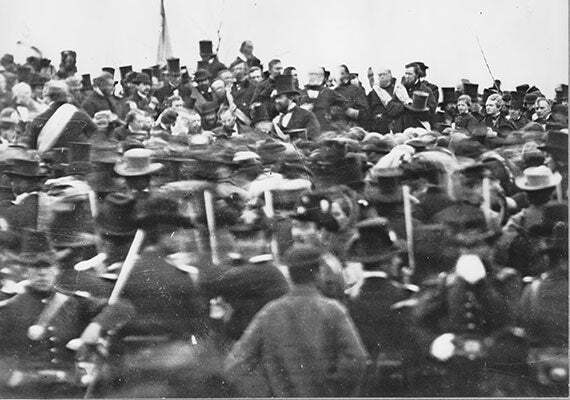 It was taken by Alexander Gardner on Nov. 8, 1863, just weeks before Lincoln would deliver the Gettysburg Address. 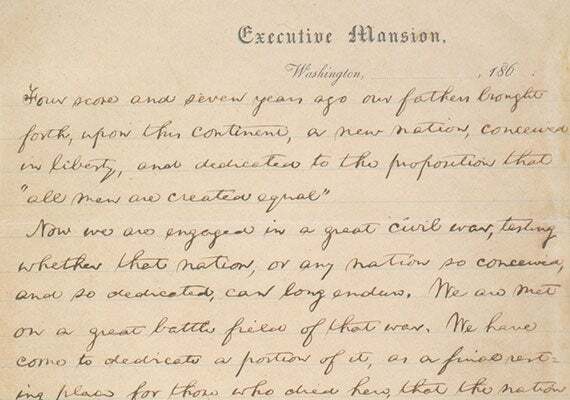 Everyone knows about the Gettysburg Address, which turns 150 years old this month. They know it was President Abraham Lincoln’s signature speech, delivered at the site of the signature battle of the Civil War, one that turned back the highest Confederate tide as it rose violently into the North. But not everyone knows Harvard’s connection to the fight or the famous address. Harvard lost 11 of its sons because of the battle: three died in the field, all on July 3, and eight others died soon after, when they succumbed to wounds. 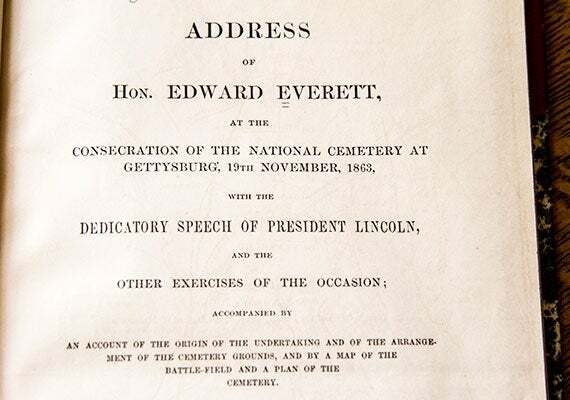 The Gettysburg Address as read by John Stauffer, professor of English and of African and African-American studies, Jonathan Walton, Pusey Minister in the Memorial Church and Plummer Professor of Christian Morals, Zora and Elijah Walton, and Harvard President Drew Faust. Sumner Paine is the sole Harvard officer from the 20th Massachusetts buried at Gettysburg, Pa. He had left Harvard in his sophomore year to join the army and died three months later at age 18 on a rolling field that became a graveyard during Pickett’s Charge, the Confederates’ ill-fated, bloody assault on the Union lines that many analysts agree effectively ended the battle and forced General Robert E. Lee to retreat with his army back into the South, to Virginia. Four months later, approximately 15,000 people gathered on the battlefield for the dedication of the first national cemetery. Bodies still lay covered by thin layers of dirt, the smell of death still hung in the air. Former Harvard President Edward Everett was the main speaker on the dais that day. Lincoln’s remarks were considered something of a footnote, a short dedication near the end of the ceremony. Renowned for his oratory, Everett delivered a two-hour address, a sweeping, 13,000-word account of the history of the battle, peppered with comparisons to the wars of antiquity. Lincoln, in his high voice and strong Midwestern accent, delivered a brief talk in which the word “Gettysburg” was never uttered. Like their speeches, the two men were different. Lincoln was an awkward, self-taught country lawyer from Kentucky. Everett was a Harvard-educated minister’s son who studied and traveled in Europe and became a professor of Greek literature at Harvard, and later its president. But the Gettysburg speech that became woven into the country’s cultural fabric was Lincoln’s. He delivered just over 270 words in two minutes, and in the process helped a broken nation begin to heal. In the run-up to the 150th anniversary of that famous address on Nov. 19, five Harvard scholars offered their views on its history, language, and legacy. Faust, whose seminal book “This Republic of Suffering: Death and the American Civil War” explores how the country coped with the conflict’s unprecedented fatalities, said that Lincoln’s words that day marked a critical crossroads for a grieving nation. With his speech, the president linked the sacrifice of those on the battlefield to a higher cause, offering the living, including those in mourning, a sense of purpose and meaning. For John Stauffer, professor of English and African and African-American studies, the ambiguity of the speech — Lincoln did not explicitly mention slavery or emancipation — was a reflection of the moment in which it was given, as well as a cause of its enduring popularity in the North and, perhaps more surprisingly, in the former Confederate states. “He gives this speech in a moment when he thinks he is going to lose re-election,” said Stauffer, author of nearly a dozen books set in the Civil War era. Despite the Union victory — on Northern soil — at Gettysburg, the U.S. military effort appeared to be flagging after more than three years of long and, for the Northern electorate, unexpectedly brutal warfare. 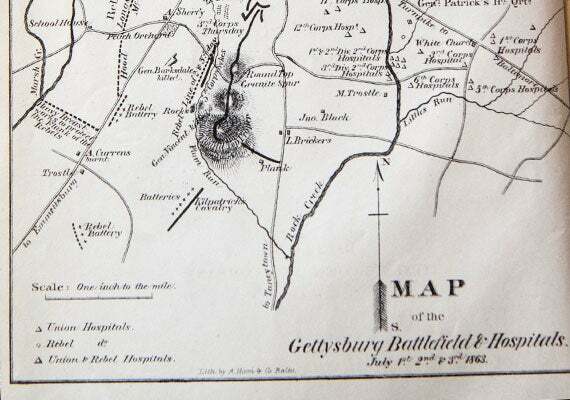 To Lincoln’s great disappointment, Union armies in the East had failed to capitalize on Gettysburg’s military success. Meanwhile, conservative Democrats in the North — whom their critics derisively called Copperheads, or snakes — were increasingly challenging Lincoln’s war policies, including the rising profile of emancipation as a war aim, with many arguing instead for an immediate cessation of hostilities. With the presidential election of 1864 approaching, Northern Democrats hoped to use the war’s growing unpopularity to turn Lincoln out of office. As a result, Stauffer argues, Lincoln was extremely measured in his Gettysburg remarks, avoiding detailed predictions about the war or its policies, instead opting for soaring rhetoric that might appeal more broadly to audiences, including those in the seceded states. Lincoln was well aware what he was asking of those soldiers. The staggering death toll weighed heavily on him, and he regularly visited wounded troops to comfort them. Walton, Pusey Minister in the Memorial Church and Plummer Professor of Christian Morals, said Lincoln’s sense of “humility and sobriety” about the devastating cost of the war comes through in his words. While some people adhere to the notion that Lincoln quickly scribbled down the address en route to the ceremony, scholars agree that the man known for crafting carefully thought-out legal arguments worked on the speech in Washington before he left for Gettysburg, and continued to tinker with it after he arrived. The autodidact relied on his knowledge of classical tradition to model his address after Greek funeral orations, and called on his knowledge of the Bible and the Bard to help him refine and perfect his message. Associate Professor of Education Meira Levinson said that while Civil Rights leader Martin Luther King Jr.’s “Letter from a Birmingham Jail,” a defense of nonviolent resistance penned in 1963, and his iconic “I Have a Dream” speech delivered a few months later are the more standard texts in civics classes today, the Gettysburg Address remains a touchstone work in many classrooms. Lincoln’s speech and its myriad themes of reconciliation, national identity, the demands of war and peace, honor, and sacrifice “can be incredibly fruitful and important when working with kids,” said Levinson, who is also co-founder of the Civic and Moral Education Initiative at the Harvard Graduate School of Education. Many educators still teach the address. Over the summer as part of a three-week theater project, members of Harvard’s American Repertory Theater worked with local high school students to develop a performance piece inspired by the Gettysburg Address and the Emancipation Proclamation. The speech figures prominently in the Common Core State Standards Initiative, a set of shared educational benchmarks for English and math that have been adopted in more than 40 states. As part of the English standards, a comprehensive, three-day module guides students through a close reading of the address. Students translate sections of the speech into their own words, and examine the meanings behind Lincoln’s arguments. Yet the address, as profound as it remains today, does contain a clear error: “The world will little note nor long remember what we say here.” As the continuing discussion shows, Americans will remember. Of the five known manuscript copies of the Gettysburg Address, the Library of Congress has two. President Lincoln gave one of these to each of his two private secretaries, John Nicolay and John Hay. This is called the "Nicolay Copy." “The Blokadnitsy Project,” an exhibit by Jill Bough, presents photographs of women who survived the Siege of Leningrad. Each photo collage (of which only a detail appears here) is framed with artifacts from the women's apartments and a statement, like this one by Emma: "The stress we felt was not just about the war. It was the fact that we were prisoners."